Smarter Home Automation and Projector Reviews Drawings: Win Smart Home, Home Theater Gear! 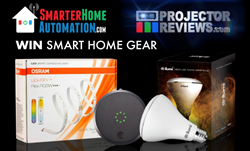 SmarterHomeAutomation.com and ProjectorReviews.com are having their first drawing – giving away hot smart home products and home theater gear to their email subscribers. Fan of smart gear and free stuff? SmarterHomeAutomation.com is having its first drawing of some really cool gadgets, and will have several of these drawings per year. This time, subscribers can win one of three home automation products from Lightify, August Home, and ilumi. This first drawing will take place on June 27, 2018. All you have to do is sign up on one of their websites to enter! These products are the Lightify Flex RGBW Strip Light Kit, August Smart Lock, and ilumi Colored Smart Bulb. The Lightify Flex Strip Light Kit is perfect for illuminating various places around the home for backlighting, down lighting, cove lighting, and mounting under furniture and is compatible with a number of ecosystems. The August Smart Locks fits over the existing deadbolt of a front or back door that allows the user to set schedules, issue temporary eKeys to guests and hired contactors, and codes for the family so they can have keyless entry. The ilumi Colored Smart Bulb is the smartest bulb around – it has its own computer built in. That means these bulbs will maintain schedules and other programming even if your Wi-Fi goes down. The product drawing is open to anyone who subscribes to the SmarterHomeAutomation.com and ProjectorReviews.com mailing lists. Winners will be notified via email. The emails will contain content for both websites in a combination email, with no more than 13 email blasts per year when subscribed to the mailing lists. Visit SmarterHomeAutomation.com or ProjectorReviews.com to enter to win. ProjectorReviews.com was launched back in 2000, and is now the projector industry’s leading, and in-depth review site. In 2006 Projector Reviews Inc. was established. In late 2015, the company launched SmarterHomeAutomation.com, as its 2nd website, to review and keep people up to date on the latest and hottest home automation gear for your smart home. Together, in the past year, the sites have had over 1.3 million “unique” visitors, who have read more than 7 million total pages.